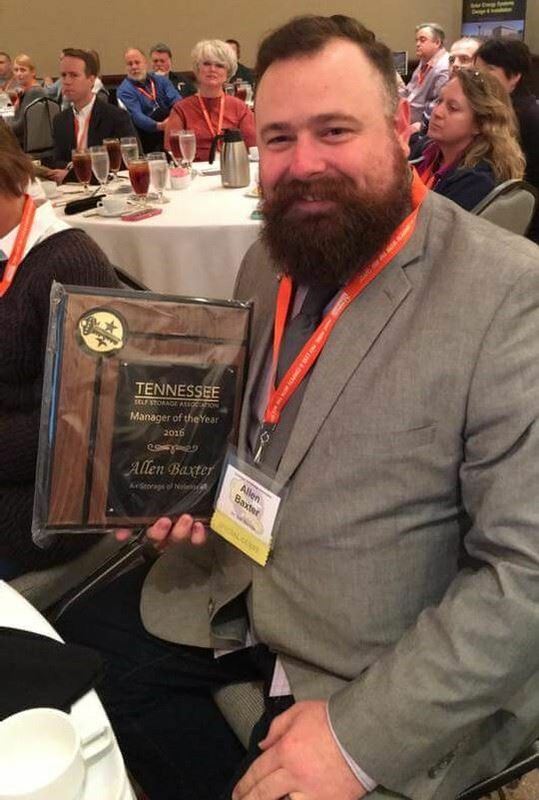 The winner of the 2016 TNSSA Manager of the Year Award goes to a manager who was able to increase his revenue over 2015 by 22% while bringing delinquencies down to a mere $961.00 in receivables over 10 days past due. He took home his company’s award for Highest Net Rentals in 2016 and has been voted Manager of the Year by his company on two occasions. He serves many organizations in his community including the Town Events Committee, Area Business Council and the Town Historical Society. As facility manager, he actively supports his community by sponsoring events such as the 4th of July Celebration, Farmer’s Market as well as the local schools. Because of his strong community outreach, he was voted hands down, to receive the Community Service Award by his company peers in 2016. Taking a quote from his nomination, “It has been my delight to continue to watch him grow in success each year and it is my honor to nominate such a deserving candidate for this award.” – Stephanie Tharpe, Sr. VP of Operations at A+ Storage of TN. Congratulations Allen Baxter! Well done! 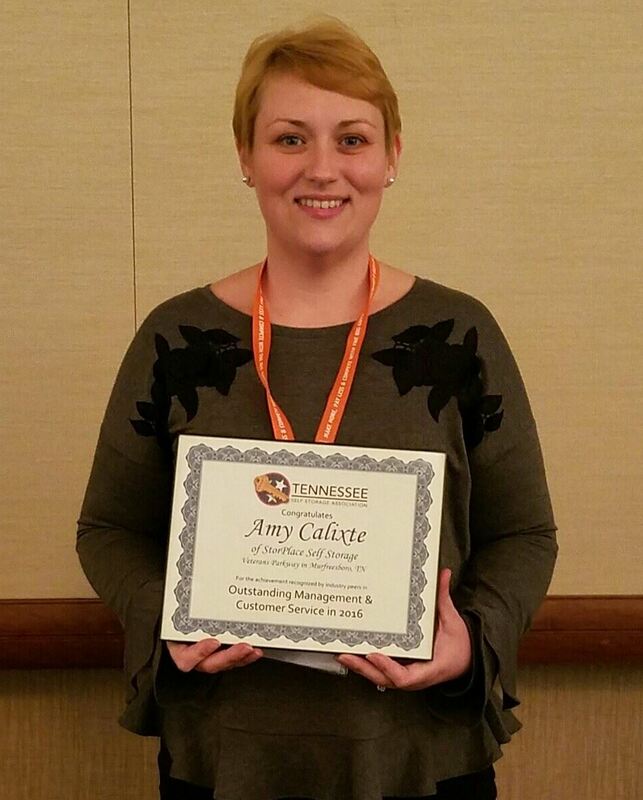 We are pleased to present the Runner-Up with this certificate for the achievement recognized by industry peers in Outstanding Management and Customer Service in 2016 to Amy Calixte. Amy has taken two newly acquired properties from operational chaos to operational excellence during her 5 year career at StorPlace, with her most recent accomplishment being the Veterans Parkway location in Murfreesboro. At this location she was able to increase the average rent rate by over $30 while maintaining average occupancy above 94% with accounts receivable averaging 8% for the year. All of this was done while operating under an office remodel, new gate installation and construction of a new building. A stickler for details, Amy consistently has one of the cleanest, rent ready properties and always scores exceptional marks on her Operational Audits. As an emerging leader, she is instrumental in training, developing and mentoring the StorPlace team to strive for the same high standards that she sets for herself! In the Self Storage Business, our managers work very hard all year long. They are the face of our business and our number one sales feature. On a daily basis, they are customer service agents, collectors, auditors, custodians, and administrators. They have to be able to write professionally, be articulate, be adaptable, be presentable, be problem solvers and multi – task, all under limited supervision. They are also our most important investment. We want to reward those who stand out and go the extra mile. The TNSSA chooses their MOTY based on Commitment to Leadership, Creativity, High Occupancy Rate, Low Delinquencies and Overall Business. In 2012, I was truly honored to be chosen by the Board of Directors for this Prestigious Award. As the recipient I was recognized in many ways. I was featured in every newsletter sent out by the Association and recognized at every quarterly luncheon and the Legal Seminar. Inside Self Storage, wrote and featured a national article regarding my award. The SSA Magazine reported the Award in the Tennessee Section of their Magazine. My local paper, the Chronicle of Mt. Juliet did a feature write up. Del Webb Lake Providence, Congratulated me in their monthly newsletter. Anne Ballard announced it in her session at the ISS World Expo in Las Vegas to her attendees. You can’t buy that kind of advertising. That being said, I would like to encourage all of you owners to pay attention to your hard working Managers and nominate your Super Stars for this award in 2015. Your Manager works hard for you. There is no greater feeling than that of being recognized by your industry peers and colleagues.